From the first time I used the Nuby Silicone Squeeze Feeder, it instantly went onto my list of must have baby products. Is it necessary for raising a child? No. Does it make life a heck of a lot easier? Yes. 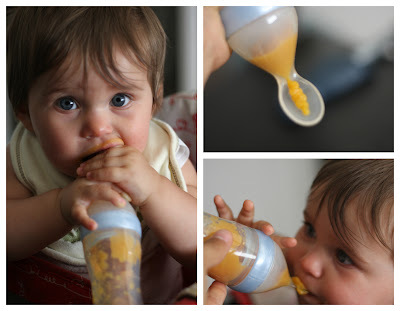 In case you aren't familiar with a squeeze feeder, basically you fill it up with the baby food of your choice, and feed baby with the attached spoon. It is that easy. I am not sure why, but for some reason I have a lot less of a mess to clean up when I use the silicone squeeze feeder. I don't know if it has to do with me normally trying to feel Isla too much in one bite, but I don't seem to have to constantly wipe her face and end up with a mess all over. The other thing I love is that I can pre-fill it with food and take it with me on the go. It has a cover for the spoon that keeps the food in. So far, in the 3 months I have been using the spoon, I have yet to have it leak on me while on the go. Also, it cleans super easily. The packaging said to expect for staining or discoloration. My spoon is still pretty dang clean. You can see in the video that there hasn't really be discoloration of my spoon. And I clean it by just popping it in the dishwasher. As with most of my small baby gadgets, I throw it in the bottle basket so I don't loose anything in the dishwasher. If you care to see a little demonstration, check out my video. You will get the opportunity to hear me overuse the word "literally". Aww, it's so fun to see one's self on video and then critique to no end. You can purchase the Nuby Silicone Squeeze Feeder online at diapers.com or the infant version meant for first foods and cereal - Softflex Infafeeder at www.BuyBabyDirect.com. I did not receive any compensation for this post, although as part of the Nuby Mommy Blogger program I may receive items to sample or review. Thanks for linking to my giveaway post here. I like your review a lot. That spoons looks great. Going to suggest it to my friends who have babies starting baby foods.